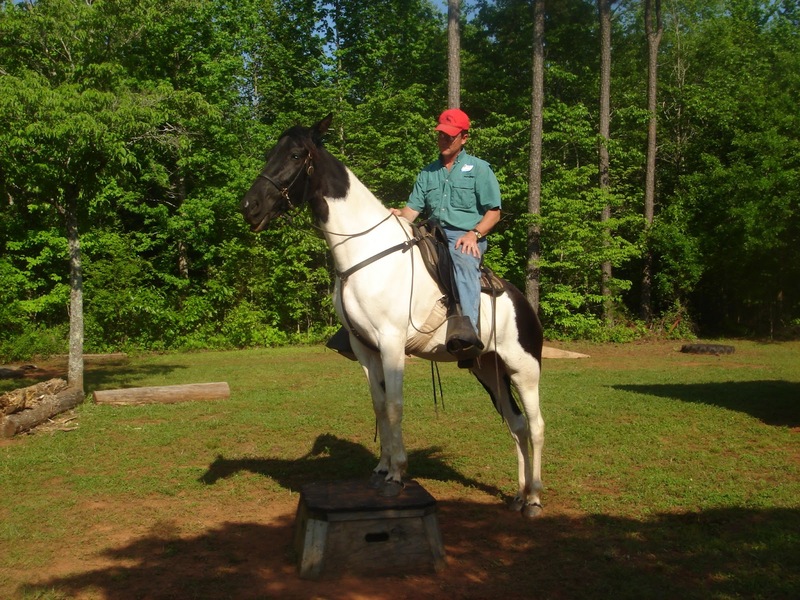 The horse trainer was hired to teach the 6 year old horse to stand still while being mounted. As a matter of manners and safety, a horse should stand still for mounting and not move until asked. The horse resisted being mounted. Some would say that horses are not smart, otherwise, they would never allow us to mount them. Perhaps this is the execption. For what ever reason the horse danced around and would not allow a foot to enter the stirrup. All such problems are man made. Corrective measures could be to tie the horse to a post and mount over and over until acceptance. Another way is move the horse round and round in the pen until the horse is willing to stand. While these methods work, the best choice is one that is easy for the trainer, and creates the least resistance in an already resistant subject. The assistant took a handful of feed, offered it to the horse and the trainer mounted without incident. The trainer dismounts and repeats the offering. Sometimes the horse gets a treat, sometimes not, but always allowed mounting. In “O Brother Where Art Thou”, instruction was given that they would not find the treasure they seek because of their “obstackles”. Such is our health; we create man made obstacles that block the flow of good health. Identifying roadblocks is key to recovery. Obstacles can be the choices of beverage, food, lifestyle, or even thought patterns. If you say, “I will not eat sugar”, the last thing you said was “eat sugar”. You could change the focus to, “I will make healthier choices in my diet”! If you say, “this is hard”, it will be. You just created your own reality! The traffic is heavy and you’re in the left lane trying to leave enough space to slow down if needed. A car speeds past you on the right and invades the safety space you created. You scream at him, blow the horn and ride his bumper until the anger passes. If you drive at all, you know this will happen, and yet you respond the same way each time. It is as if the bad driver conditioned YOUR response. Would it be better to just ADJUST your position? Healthy relationships are important. We may want others to respond differently knowing they won’t. So we keep hoping and continue presenting the opportunity for THEM, and become upset when the outcome is not different. Did we create resistance? Should we be angry with them for not making the choice we wanted? When working with animals, if there is a problem a smart trainer looks to themselves first. Do you force the situation or ask what can I do differently? Do you break a horse or start one? Do you “break” old patterns or START new ones? Some easy choices may not always be the best choices. Be open to the possibilities of other choices. Am I offering the most effective solution to what seems like a difficult problem? Sometime we feel LOCKED IN. We can not see any other possibility. It may not be as difficult as we create. Resistance is negative energy that we create. Choose to live a resistance free life.